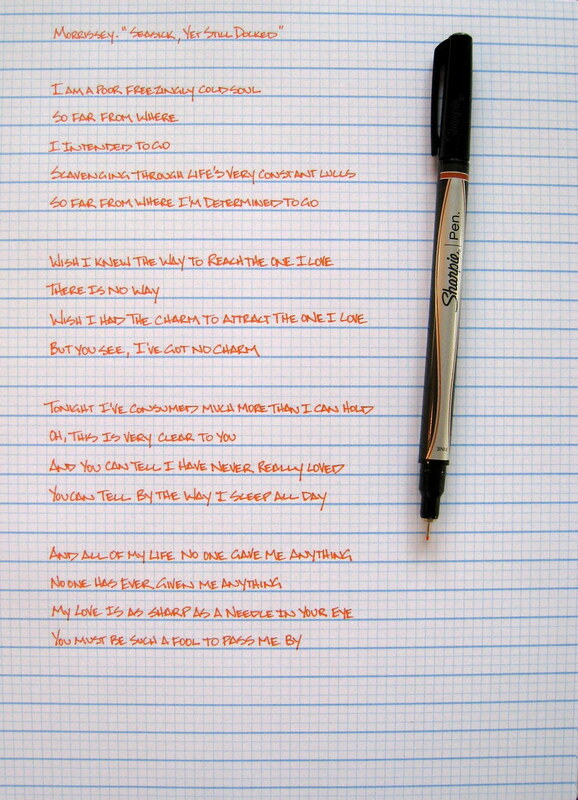 I have some of the new Sharpie Pen RT pens courtesy of Office Supply Geek, @SharpieWhit, and Office Max, but I had this Sharpie Pen Orange review sitting in my queue for a while now so I wanted to push it out there. This color is fantastic. It comes in a 6-pack with black, blue, red, green, and purple, and some readers have seen a 5-pack minus the red pen. It is really bright and enjoyable, so why not transpose some lyrics from one of the most depressing songs ever! Luckily (?) for me, depressing songs tend to energize me with their emotion, so Morrissey's "Seasick, Yet Still Docked" is one of my favorites. Check out the excellent live version below, and go forth and find some orange Sharpie Pens! Posted on September 4, 2009 by Brad Dowdy.